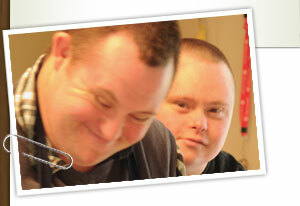 This section is for you if you are a young adult with an intellectual disability. Look through it for suggestions and activities that will help you on the path to finding friends. This is your project, but don’t be afraid to ask for help if you need it. Looking for friends can be scary, but it is worth it. Remember: You belong! Philippe and Robin introduce themselves. They talk about their friendship. They talk about things they like to do together. They talk about what they like about each other. It is easy to see that they enjoy each other’s company. This handbook will help you make the best use of the site. It explains how to use the different features. Audio: Make sure your computer speakers are on. At the top of each page there is a button that says “Listen.” Click on it. You will hear a summary of what is on the page. Listen: Most stories have a “Listen” button. Click on it to listen to the story. Video: Some pictures have arrows on top of them. These are videos. Click on the arrow on the picture. The video will play. The videos give some examples of friendship. They talk about what friends do together. They talk about how to stay in contact. Subtitles: Some videos have subtitles. If they do, you will see a small “cc” under the video after it starts playing. Click on the “cc” to turn the subtitles on or off. Activity/Information Sheets: If you see an icon under this title you can click on it to open a document. You can print it if you want. Ask for help if you need it.